All available at my etsy shop. zero.etsy.com. 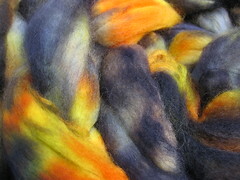 BlackBunnyFibers.com 90/10 delaine merino-mohair, "marigolds"
I dipped my toe into spring by buying a fleece (ha! three now, and Lambtown has my name ALL over it this year...) so wanting practice I broke out my Strauch handcards (...foreshadowing, wait for it...) and carded the roving into little cloudy rolags of happiness. 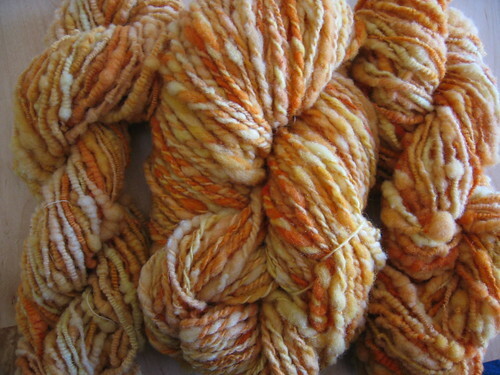 This was a nice way to practice on clean fiber, as well as separate colors because each rolag has so little actual weight I was able to really get the colors to stand out from one another without blending out Carol's beautiful dyejob. 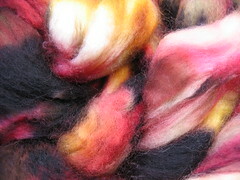 This was my first attempt, as well as the first bobbin of singles. After coiling, I found that the rolags really aren't ideal for this kind of yarn-- the typical woolen spun fuzziness obscures the coil effect in parts. 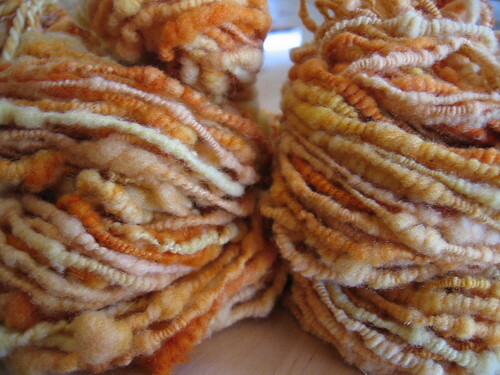 I also spun this first one with lots of slubs, thinking that the 1-2" or so unspun bits would work well but instead finding them too short and too soft-- they look like gigantic pills on the yarn when coiled, and you can't see the coiling at all in them. I took what I figured I learned and spun up the other 3 bobbins of singles with an eye to coil all of it... and to be honest? Once I finished another 2 oz of supercoil yarn I was kinda over it and just took the remaining 2 bobbins of tightly spun singles and plied them together. 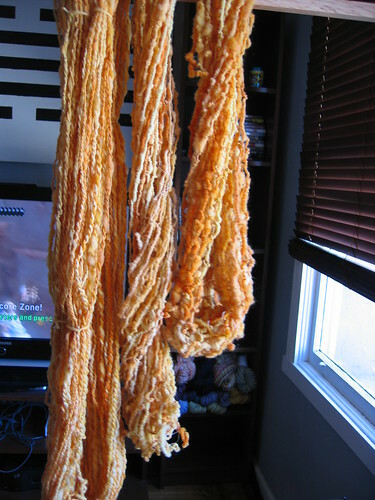 I wouldn't have normally spun these singles so tightly for a 2-ply, but I really just couldn't hang with the orange coiling any more! 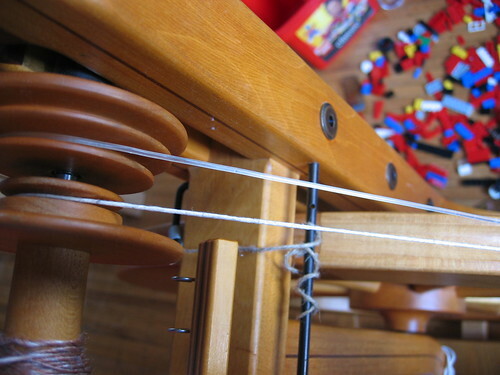 All of this talk of tightness and plying and such, but a picture is better. left: 2-ply. 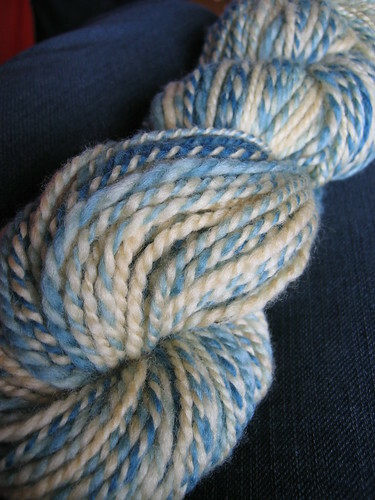 middle: 2nd attempt at supercoiling yarn. right: 1st attempt. Now, these hanks are all technically the same circumference... see? 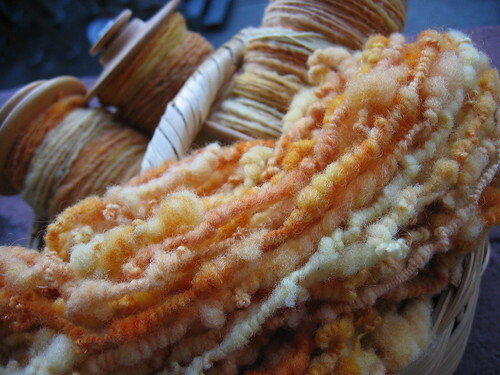 The 1st coil yarn is on the right... you can see what I mean about the slubs looking like "pills". 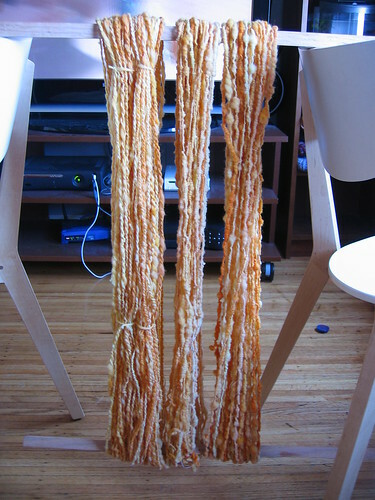 The second coil yarn's coils just look "tighter" even though they're really not-- spinning its singles with a special eye to firmness and no slubs (but varying thick/thin widths over stretches), but I don't think that the skeins will be distinguishable in the final project. I'm kinda-sorta planning on making this "Go Diagonal" scarf-- it was featured in Intertwined, but is a free pattern online. That, or sort of a hoodie that winds into a scarf... there's one in Intertwined (and one like it here-- Nomadic scarf in IK Fall 2007), but more rustic and simply in garter. My supercoil may have been on the thin side since I used a silk sewing thread, a heavier weight stabilizer like a mercerized crochet cotton would prolly give a thicker look. 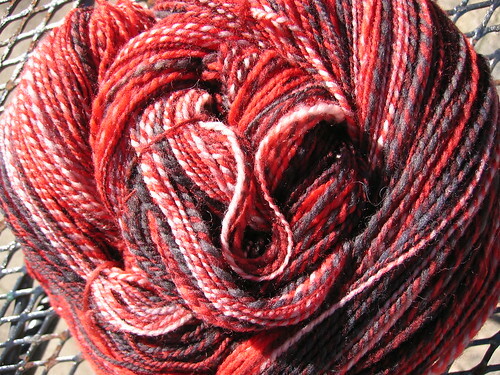 I think I also spun my singles too finely overall, a heavier single would need less twist to be "tightly spun" and would make a thicker yarn in the end (notice how the 2-ply is thicker than the supercoiled yarns?) It's all still bulky, but a really bulky supercoil would be great, as well as softer. 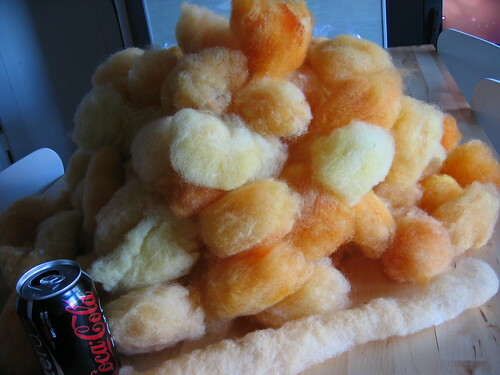 I don't know if I'd use a superplush fiber supercoiling again though, you do lose the softness in anything that's overspun. I don't really buy yarn anymore. 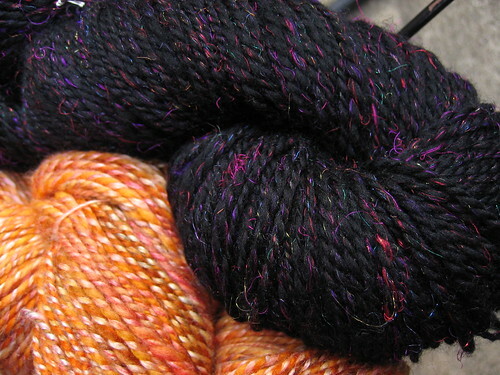 * I'm just going thru a non-yarn phase, but really... Alyson said she had done some overdyeing of koigu and louet sport for TheYoYo shop and I was like, oh that's nice but I wasn't going to buy anything (or even look!) since, well... no yarn thing. Then I saw these when I logged into etsy a few days ago to upload new stitch markers and was like some gunslinger hitting the buy button, I didn't even write a little dorky comment like I usually do when I buy from her shop for fear someone would snake this yarn from me. Alyson usually sends pretty rad gifties along with stuff you buy from her shop... how do I know? 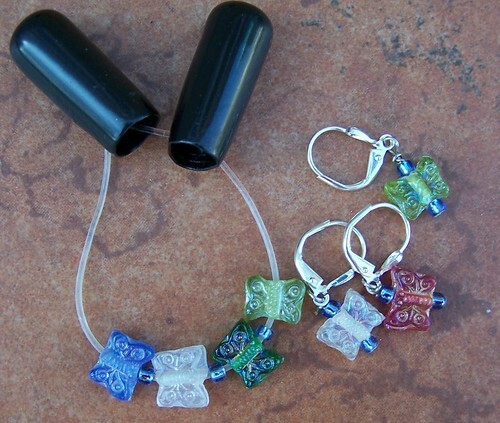 Pretty rad = stitch markers from zero.etsy.com ;) I'm a big paperedtogether fan myself, so these were a treat. 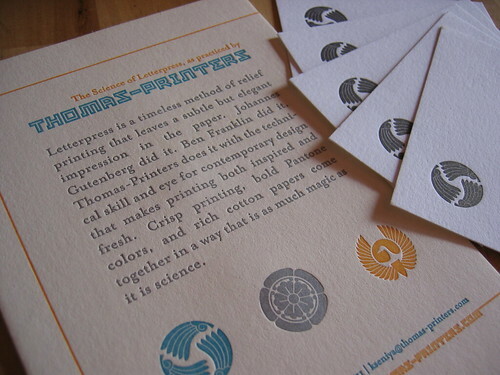 It's a flat card on that excellent paper, printed on both sides, about letterpress. 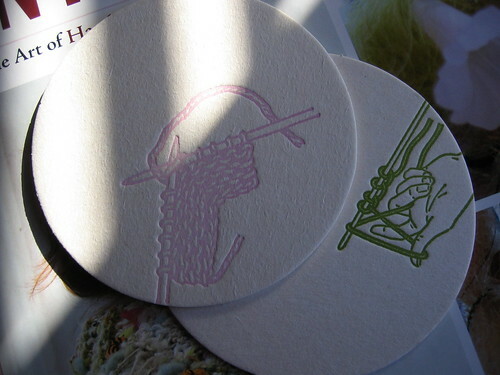 Also, little blank "calling cards" (business card sized), blank with a beautiful pattern in the corner... already seen some use, and will see some more. Those are my favorite things, the extras I can use and know others will enjoy receiving when I pass them on. 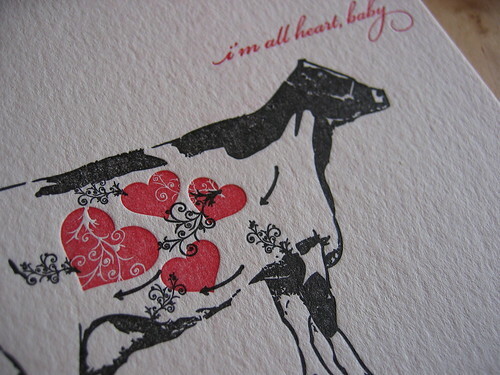 It's getting dark here, another late etsy friday but, no matter :) See you soon, miss you despite it all. 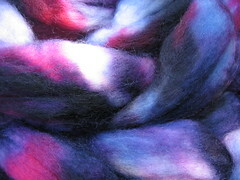 Finally, the black-black of the superwash merino, and the magenta and purple sari silk, and even true hints of the lovely glitz (but yall know how hard glitz is to capture, anyway). 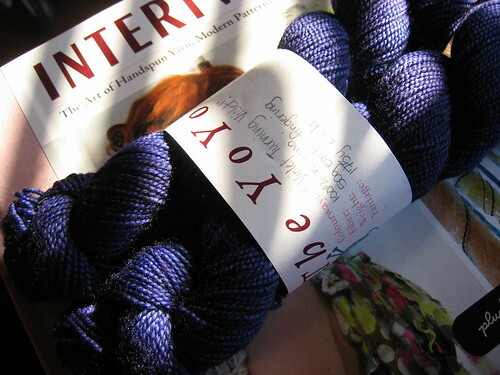 I am just as excited about this yarn as I am the batts... 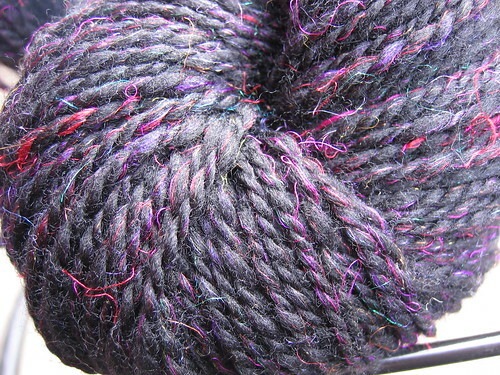 I mentioned a while back that I didn't think I could spin a 96% black yarn, but writing that I had already spun part of these batts; I don't consider this a "black" yarn, even though it very much is. 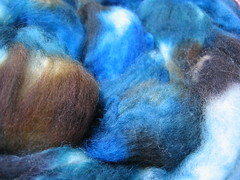 It's just that I don't really get excited about solidly dyed fibers, and that's what I meant... it is really hard to express in word and picture that this isn't a black yarn, but a yarn (and fiber) that uses its solid palette to let shine the ethereal and varied colors it has been blended with. 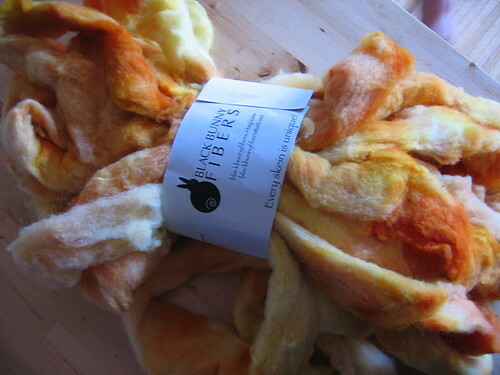 I also really want to say something about the batts themselves as well, the fiber. 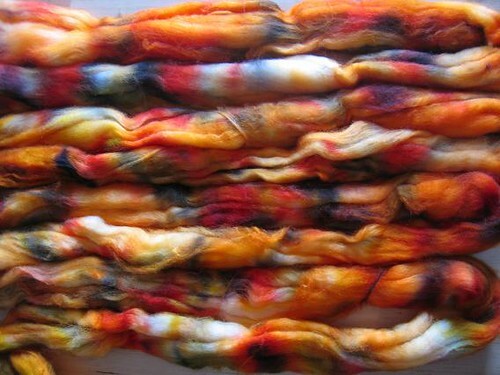 I am used to fibers in roving or combed top form, where they are slightly compressed and need some love to get drafting nicely just because they've been dyed and rinsed and dried and handled til they get smooshed and a little uptight. 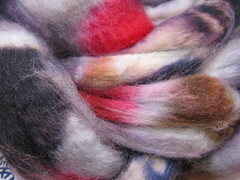 A plus about these batts is that Josette uses a commercially dyed sw merino top (a guess! tell me if i'm wrong, k? 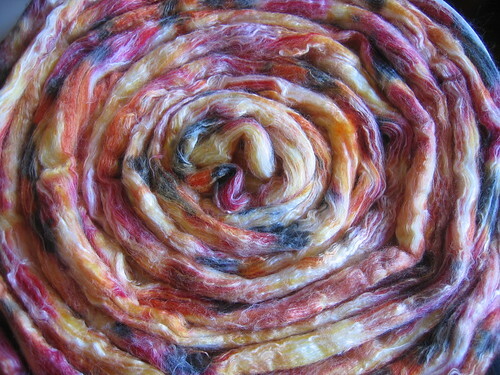 ), and with its already aligned fibers being opened up and sprinkled with the glitz and sari silk on her drumcarder, it is *crazy* open and soft, and drafted like no one's business. 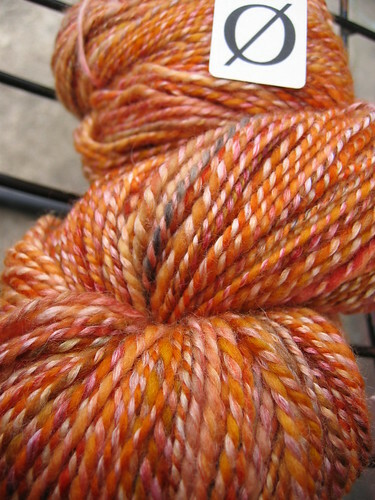 I love spinning sock yarns from handdyed, combed top, and have found spinning from batts to be less ideal for me (just the way I spin and how I prefer aligned fibers' look in the final product)... but these batts are the exception to that rule. 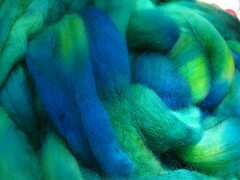 You can look closely and I bet you wouldn't guess this was a fiber from a batt, as smooth as the final yarn turned out. 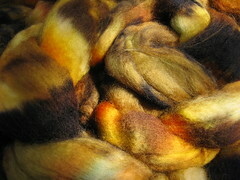 ...the singles were so limp and soft that I really couldn't bear to ply them as tightly as I normally would. 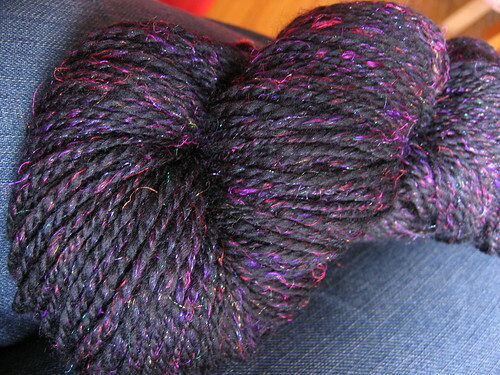 Again, not a great pic of the black merino but you can look closely and see what I mean-- there is no part of this yarn that is a solid black at all and isn't super smooth. 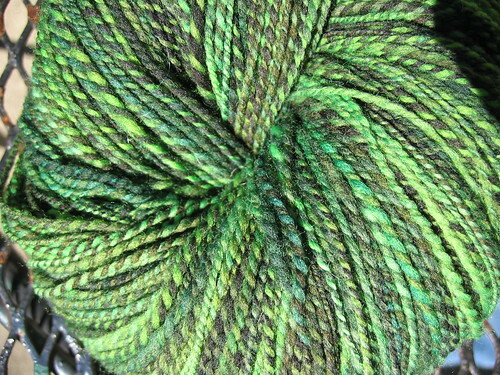 Seriously going to make some gorgeously bling socks, that's for certain. 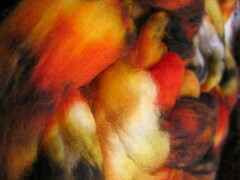 Before I started spinning I expected a very orange skein of yarn, but this is more... tangerine? No, a fifty-fifty bar... the bamboo ply is definitely lighter and carries with it a light, the need to reflect light and shine-- much more than the seacell ply did in the mercutio yarn. 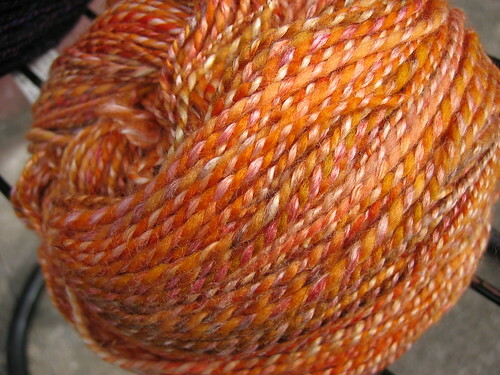 It's a fun looking yarn, but it may be too... shiny for me knit up. We'll see. In the meantime I have 2 oz each left of the colorways... next time, I think I'll randomly alternate lengths of 100% sw merino and the bamboo blend in each single-- it should ply up superfun with places where the bamboo blend and the 100% merino blends match up with one another. Spring's creeping up on my brain... I forgot it was etsy Friday :) I didn't want to let this one slide though, look how fun! 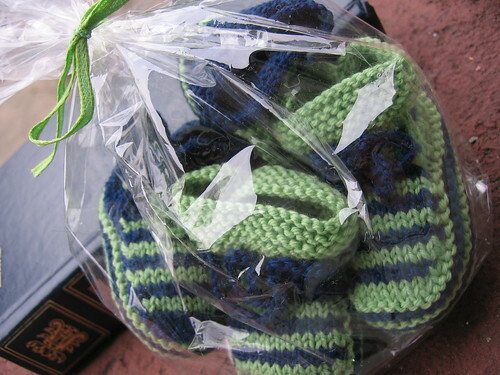 This was a custom order, I asked her to make a set of blue with green stripes and green with blue stripes for undoubtedly the cutest twins to grace my family tree ever (til mine, of course! ;))... I think she said the yarn was Dale Baby Ull? It's very soft, and totally appropriate for tiny feeties. The detailing is fantastic, from the little drawstring thru eyelet holes around the ankle, and the really sweet packaging-- they're being gifted just as is. It's funny, I never ever thought I'd buy something handknit cos, you know-- we can do it ourselves! 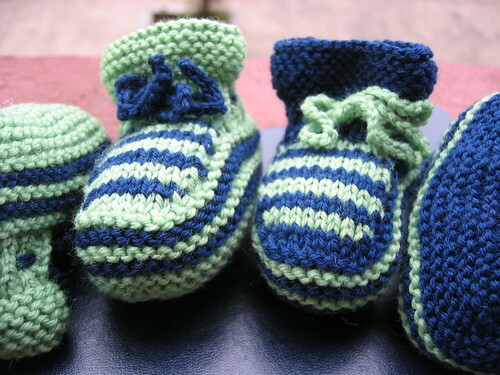 Really though, I wanted to knit something like this for the kids but hadn't gotten around to it, and the workmanship is stellar AND they're still handknit (no, I'm not going to try and pass them off as mine!)... so the gift really does keep with the spirit of me trying to foist handknits onto these kids ;) The purchase has definitely opened my eyes to looking more closely at finished handknits on etsy, though I haven't bought another (yet). 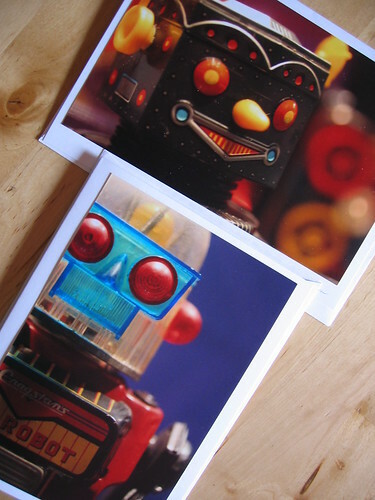 Seriously though, April's work is always reliably top notch-- I've bought enough cards to know :) She also always has new stuff and a flickr stream chock full of more she'll do custom orders from, so... yeah. I couldn't help myself! Falling in line with the idea that handknits are not inappropriate for knitters to buy, I just love this little vase. 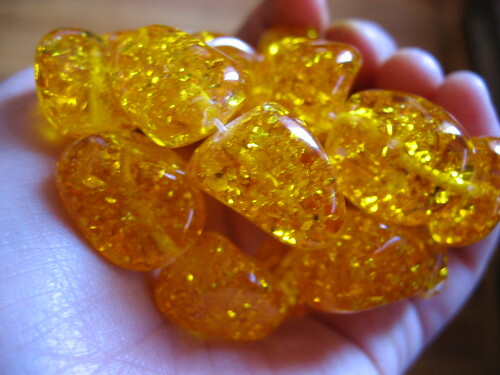 It just looks like a perfect little organic cache for special pendants to leave at the bedside, for those tiny things that need as special a place as they are. 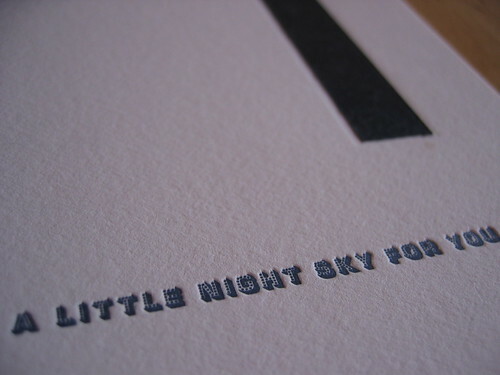 I'm also pretty jealous of the simple beauty of Black Mustard's presentation and photography, but in a good way. 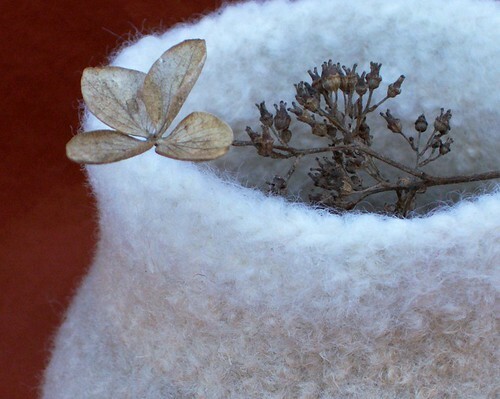 Black Mustard has a lot of felted (both wet and needle) items (like this clutch that is too awesome), as well as handspun yarns... I like the idea that I'm too chicken to needlefelt, but could have something awesome (and even custom!) with blackmustard's help. *and now for the political portion of our program, feel free to tune out. Barack Obama's campaign is asking for 100k postcards from women around the country to be delivered to undecided voters in Pennsylvania-- you can read more here, and see mine here. It's totally a spring twitter*pated thing, no doubt an obsession with a big sturdy addition to my life thing. He makes me grin uncontrollably with his presence, attention, love (and it hasn't waned!!)... He's been around long enough and deserves an introduction. I wasn't looking for this, this new obsession but it has hit me hard and to my core. 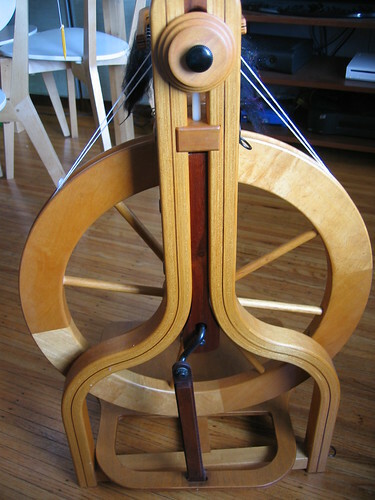 I bought the Matchless from a seller on Craigslist who was local to me and had too many wheels to care for-- he came with two extra bobbins, a high speed whorl, and a price that made this unreachable wheel possible. I've since given him a good once-over rubdown with Wood Beams (I could tell he loved the pampering, as much as he laid back and drank in the oily wax I rubbed in!) 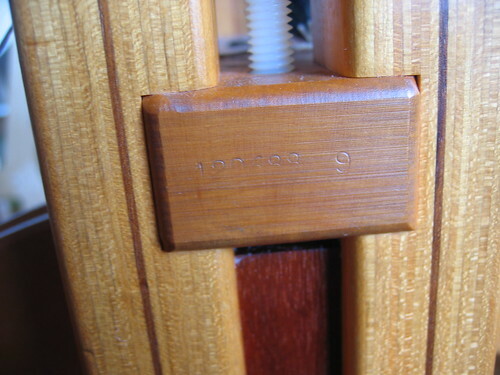 and added a scotch tension setup since it was missing. 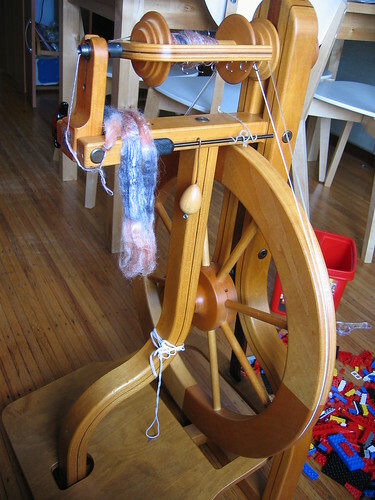 ...stretchy drive band around the flyer/whorl, and the cotton Matchless band cut down and wound around the bobbin-- two separate loops but still spinning in double-drive mode. I like the idea of double drive, spinning without having to adjust the takeup tension, but I wasn't getting the amount of uptake I like. 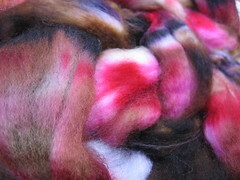 I spin a longdraw method, letting the wheel draft the non-predrafted fibers out as I pull back with my fiber holding hand and leaving my empty hand free to help when needed... The tensioned pull between us helps me put more tension and less air into my singles, so they aren't as soft and wooly as long draw spinning would usually make them. I found this sweet spot in spinning on my Joy, and didn't want to change my style of spinning just because I was on a new wheel. In the Matchless' 'regular' double drive, I'd have to ratchet up the tension to the point where treadling became difficult when I found the amount of pull on the fibers I liked... with the hybrid setup, I can tie the cotton band more tightly (than the tension of the stretch band) and still manage the tension knob to finely tune the takeup-- it's working well. I bought the drive band material (as well as the Schacht's scotch tension spring, Wood Beams, extra cotton drive bands and a slow speed Matchless whorl) from the super kind folks at Mielke's Fiber Arts who had everything in stock and shipped lightening fast. I cut the drive band to size (it came in a loop for another wheel, and I have the same amount left over)... and melted the ends with a lighter. It *only* worked when the plastic melted and blackened, not when the plastic was just soft-- but once it did and the ends were sealed together, it has held well. He's an older style matchless with a walnut insert at the back. Scoping the new Matchlesses (matchlii? :)) at Stitches West, I saw the newer ones had an all-maple back with walnut accents, exactly the same cut but just different colored woods. ...backing off since I'm setting myself up for daddy jokes again, I'll just say I'm in love. 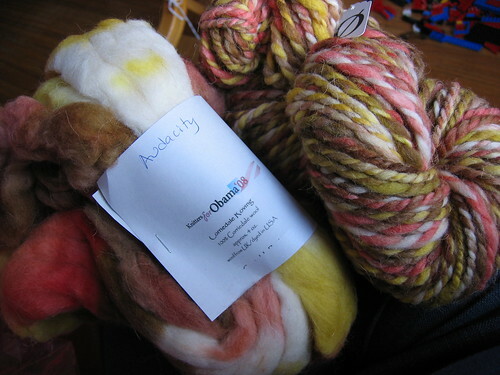 Handspun 2-ply sock yarn, superwash merino from Fiber Fiend-- "Mars"
Handspun 2-ply sock yarn, superwash BFL from Dyeabolical Yarns-- "slither"
Handspun 2-ply superbulky, Corriedale from Black Bunny Fibers-- "Audacity"
...there's more but whew, later! :) Need to refill that swimming pool. *i have five four three hellotxt mobile coupon codes... so you can use hellotxt on the go to update your twitter, tumblr, jaiku, pownce, facebook, meemi, beemood, GoZub, frazr, AND numpa accounts from your mobile handset. 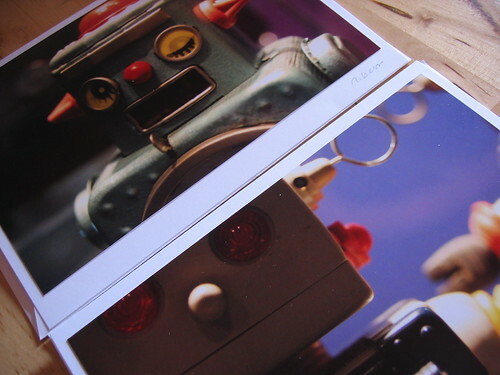 email me if you want one (very bottom of the page), and i'll update here when they're all gone. you only need this code for the mobile version, hellotxt works just fine from a desktop already (and even the non-mobile version works on my ipod). I finished this literally minutes before leaving for the Amtrak Stitch and Ride train to Stitches West 2008, too little time to really think if I liked the sweater or not :) It has definitely grown on me-- I steamed the jacket that morning, planning on giving it a good wetblock when I had composed myself from the *best weekend evar*-- but have been wearing it daily and haven't had the chance, enjoying it that much. 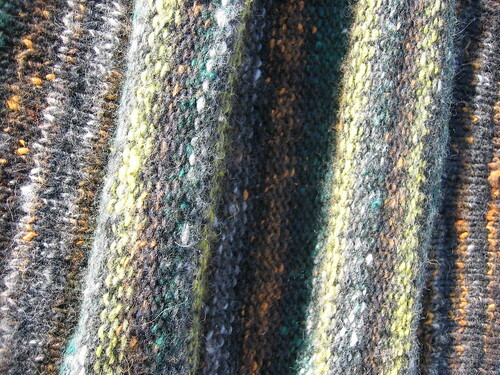 I expect to love the feel of it even more once it does get a good soak; judging from the way the sample of Silver Thaw I had from Article Pract's Noro yarn tasting acted after a trip thru kookaburra, it becomes just heaven. ...Meanwhile, back on the farm. The jacket reminds me of the Hot Lava Cardigan (PDF!) by Blue Alvarez Designs... 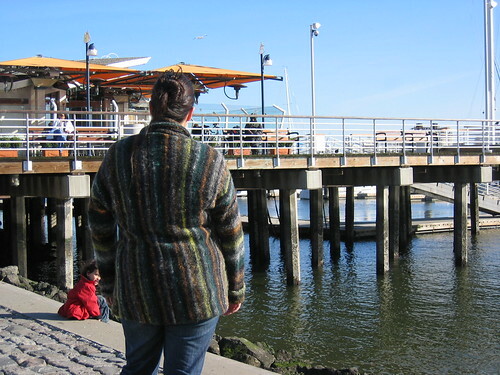 I knit it forever ago in Malabrigo Chunky, and it has a similar feel if not construction. Looking at that above pic, I realize that I prefer the management of the roll collar on Imogen more, though don't like the way it looks here rolled up. It is the construction of Imogen that is so interesting and almost confounding... I had to sketch the schematics myself so I could understand how it was knit (which makes a difference if you want to alter the length or width of this unconventional pattern). It is easy when you get the hang of it-- I had *no* seams to seam up when I cast off. The entire thing is stockinette, and can be worked with no seams-- not a typical sweater, but the first adult one I've completed! Getting ahead of myself though. I did modify the pattern a bit-- I started with a provisional caston, so later on in the pattern I wouldn't have to pick out the caston to start one of the arms/front of the piece. This made life a lot easier, I'm thinking. They weren't real mods, just to get the pattern sized the way I wanted it to fit me. For the following size changes, I used Imogen's sizing numbers as written in the pattern, plugging them in instead of the numbers for the L size. 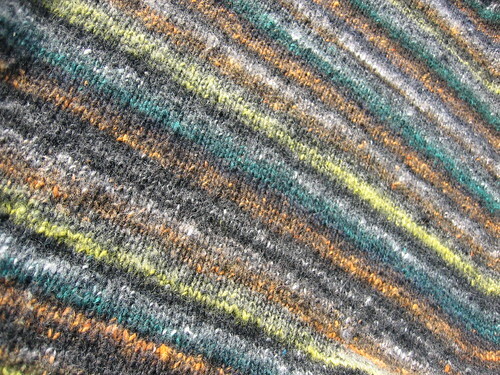 For the back, I took out several yards of the yellow striping from the color. As wild as these colors look to me already, the yellow just stood out even more. (These pics were taken in fullon sun, so the brightness of the yellow against the relative darker hues of green, black/grey and orange may not be obvious.) I did leave some yellow, and for the arms and front I didn't take out as much since it wasn't as jarring for some reason. Amy said her Imogen's back slouched in that shrug way b/c of the construction, mine did too but less so. 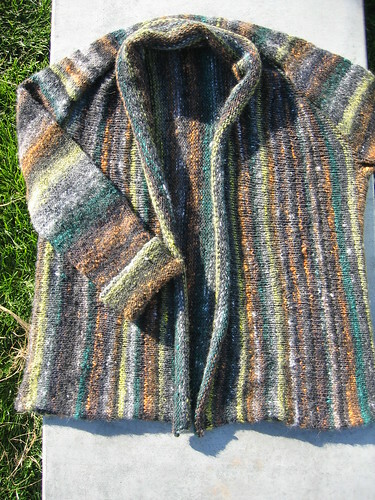 Someone who really understood the schematic/construction of this jacket and wanted to take the time could devise some short row/darting to combat that, I think... but part of the thing about this sweater is that it is sort of slouchy and comfy like that. The pattern calls for you to knit the arms flat and seam them up-- there's really no good reason to, unless you like that sort of thing. Instead I just knit the arms in the round, using magic loop and the same circular I knit the back on (32"). I knit the arm lengths as recommended but put them on waste yarn instead of casting off-- I had a hard time seeing how it would fit lengthwise when both were on, and since they're knit top down and in the round, no reason not to. I'm glad I did-- I needed to take out a little extra length once the entire jacket was done and the arms laid as they would when worn. 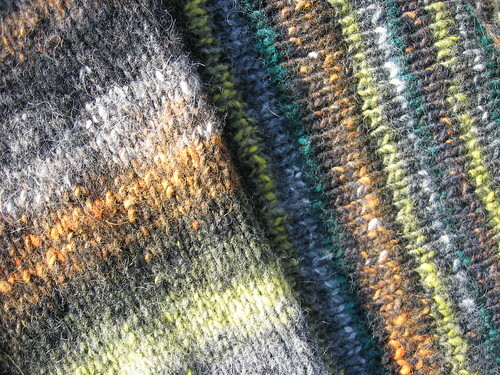 As I said before, using the provisional caston made life a lot easier when knitting the second sleeve. Once that was done I picked up the sts for the front using the 48" knitpicks cable. Even picking up a bunch of sts at the underarms to try and cut down on holes there, I was only able to pick up enough sts across the back equivalent to the number given for the M size. You can see the collar's sts are more "open" than the back-- not only from use but for a spacing that doesn't quite add up. I didn't sweat it though... I really was worried about the qty of sts across the neck, I hate the feel of bunchy fabric at the back of my neck. So much so that when working the short rows for the front, I used the M directions/spacing numbers so that they hit about 2" shorter than the L directions do (lower on the chest, so not as much fabric far up the neck/collar area) and knit the XL number of short-row repeats so I could get more coverage across my ollieollie frame without the extra roll of fabric at the back of the neck. It worked fine-- I like the amount of fabric it created there, even though I didn't get a good picture of it above. The overlap in the front is enough that I can secure it if I wanted, even though I actually prefer it open. I think I may go look for some fancy closing stick though... when it's windy the front blows open too much, totally missing the point of a wool sweater. The edges all roll since its stst-- even the lower edge of the back though its not a traditional stockinette edge. I managed to steam that flat and it's stayed, but it can be a consideration when thinking about the length you want to knit (if you have a fabric that is going to roll and not be tamped down, you may lose length). The collar of course rolls, but a stick will help-- same deal for the cuffs. I really like the castoff details PerlGrey gives for both the cuff edges and the front collar-- it rolls in so it's not really noticeable, but a nice knitterly detail nonetheless. If you're thinking about knitting Imogen in Silver Thaw, note it has grown in length from when it was cast off during wear. Not bad, but noteable. The arms also grew from a perfect length before steaming to 2" too long... I'm a little afraid to wetblock it for that reason, too! I had planned to take out the extra cuff length, but I actually like it rolled up, that whole comfort sweater thing. The entire effect of the sweater is like being wrapped up-- picking a yarn you love and knitting this pattern in it only helps. 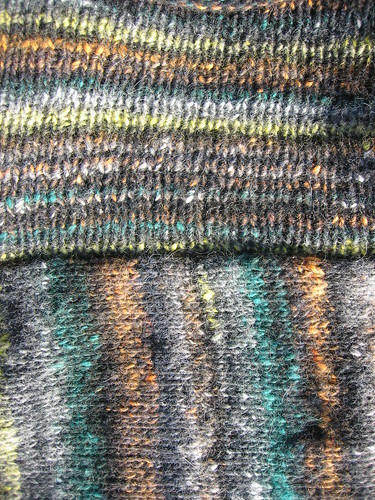 Part of the fun of using Noro in this project is getting to see how the long striping repeats work over several different stitch counts; the back, arms and front all have different row lengths, so you get a good variety of striping widths from the same yarn.